It appears that this winery was not allowed to call their 17.1% alc./vol. dessert wine a Port Wine, because it’s made and bottled in Florida rather than Portugal. But rather than give up and call it something boring, they found a witty but fairly subtle and lawyerly way to get their point across. … but they misspelled “its” as “it’s.” where was the copy editor? Not that I would call shenanigans, but there are ports made in the USA. no, they had it right…”it’s” is correct. grammar 101. Here is a California winery dealing with the same issue and proposing a computer-oriented solution rather than a nautical-oriented solution: http://www.thedieline.com/blog/2008/10/usb-port-wine.html. 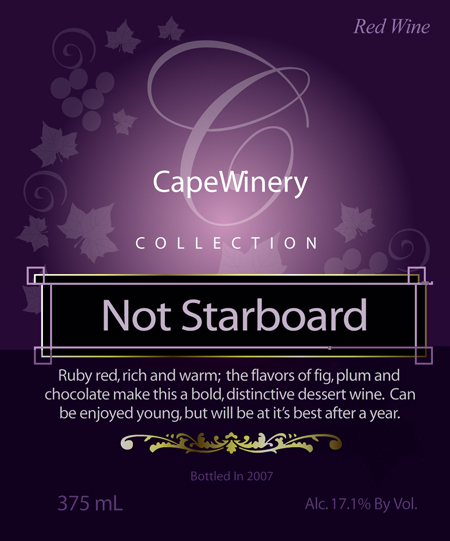 The term “Starboard” rather than port has been used for many years by the Quady Winery in Madera, CA.